e-PAIN from e-Learning for Healthcare is the place to start for anyone working in the NHS who wishes to better understand and manage pain. 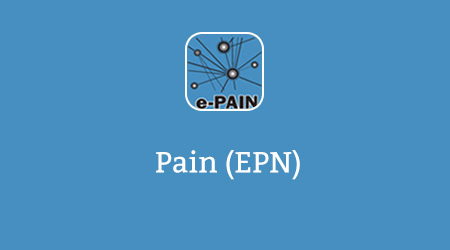 e-PAIN is a multidisciplinary programme based on the global organisation, the International Association for the Study of Pain’s recommended multidisciplinary curriculum for healthcare professionals learning about pain management. Registration to the programme is free to all NHS staff members. Pain touches everyone. It is a universal human experience and one of the most common reasons to seek medical advice. Pain is more than just suffering, it can impact on individuals and affect their day-to-day physical activity, emotional wellbeing and sometimes that of their family. Pain can affect any individual’s ability to work and as a consequence impact on both their community and society as a whole. Pain touches not only individuals – healthcare professionals in many areas understand the impact of poorly managed pain in their everyday work. (iv) ensuring good clinical practice. significantly advance their knowledge to aid improved understanding, attitudes, clinical practice and outcomes. The development of this educational initiative in pain management utilises the knowledge and skills of the team at the Royal College of Anaesthetists, Faculty of Pain Medicine and its partners who successfully delivered the award winning e-Learning Anaesthesia programme and, on behalf of the Academy of Medical Royal Colleges, the Academic Medicine module. Authors and editors are also drawn from the executive and membership of the multidisciplinary British Pain Society who have considerable experience in multi-professional educational initiatives. This module provides an overview and introduction for non-specialists to the topic of Pain Management. The Module editor is Dr Robert Searle. This module explores persisting or chronic pain and what can be done to help people learn self-management skills. The module editor is Dr Paul Wilkinson. This module looks at the treatments available for pain, both pharmacological and non-pharmacological. The module editor is Dr Roger Knaggs. This Module covers important persisting pain conditions that together make up a significant proportion of the burden of pain. The module editor is Dr John Hughes. This module is currently under construction. Further information will be provided soon. This module deals with the diagnosis and evaluation of neuropathic pain and then looks at various instances of neuropathic pain and practical issues with the use of neuropathic pain medicines. The module editor is Lesley Colvin. This module will raise awareness of developmental, family, therapeutic and organisational issues that all need to be addressed in order to better manage pain in children. The module editor is Dr Richard Howard. This module covers the effect of pain in older people. This module covers the effect of pain in a number of special populations. This module explains the physiological and anatomical aspects of pain and pain management and makes use of a number of existing sessions drawn from the award-winning e-Learning Anaesthesia programme. BJA Education (formerly CEACCP) is a joint venture between the British Journal of Anaesthesia and the Royal College of Anaesthetists. Together, they have produced many articles related to Pain which can now be found in the e-PAIN eLibrary module. Click here to view the library. If you already have an account with e-LfH, then you can enrol on to the Pain Management programme by logging in to the e-LfH Hub, selecting My Account > Enrolment and selecting the programme. You can then access the programme immediately in the My e-Learning section. In the event that you do not qualify for free access to the Pain Management programme, you are able to license access through eIntegrity, a community-interest company established for this purpose. For more information on the licensing options available for the Pain Management programme, please visit the eIntegrity website. The Pain Management Programme is also available to NHS healthcare staff via the Electronic Staff Record (ESR). Accessing this e-Learning via ESR means that your completions will transfer with you throughout your NHS career.